The 2013 Africa Cup of Nations Tournament is nearing its final stages and the KwaZulu-Natal Provincial Government in partnership with eThekwini Municipality calls on all our citizens to give their full support and blow their vuvuzelas as Mali take on Nigeria in a spectacular semi-final showpiece scheduled for Wednesday, 06/02/13, 17H00. 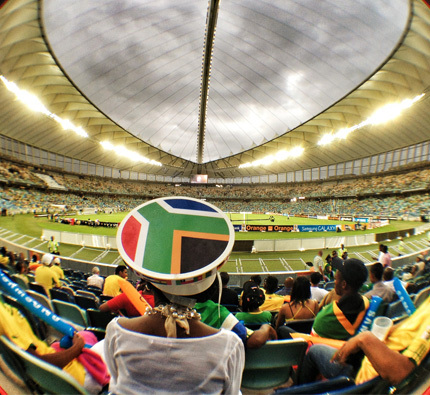 The City has been abuzz with fun, colour and excitement as people from different races, cultures and social backgrounds rallied behind our national pride, Bafana Bafana. The Provincial Government in partnership with the City would like to sincerely thank all citizens of the country and beyond for their enthusiasm, hospitality and patriotism. We congratulate Mali and Nigeria for getting to the semi-final stages and wish both teams the best of luck as we get closer to crowning the champions of Africa’s biggest soccer tournament. Bafana Bafana is out of the tournament, however, all citizens are urged to continue to wear and decorate their vehicles with their national colours. They should continue to show their undying spirit of support for the teams that still remain in the tournament, as they have done so beautifully since the beginning of the tournament. Pietermaritzburg, Durban University of Technology (Indumiso College). To show our patronage and hospitality, the KZN Government together with the eThekwini Municipality will embark on a motorcade, aimed at drumming up support for the two teams. The motorcade will leave from the Centrum Site parking on Tuesday, 05/02/13, at 12H00 and will visit various areas around the City Centre.